Before her glorious reincarnation, Eliza Gilbert lived quietly in Islington for three months. She had left an abusive marriage in India and a grand romance had ended. Twenty years old, with only a small temporary allowance from her husband to live on, she moved to a humble cottage in Hornsey Road. Her naive dreams of a brand new life among London society were in tatters. 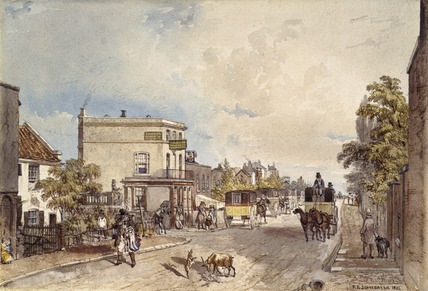 More than an hour by carriage from Mayfair and the fashionable theatres of the West End, Islington was decidedly suburban and Hornsey Road edging towards countryside. There was a farm across the road, fields stretching away in the distance. It was here among merchants and shopkeepers that Eliza had to think seriously about her future for the first time. Throughout that summer, she clung to the remnants of her position as a respectable married woman. In October she made one final attempt to salvage her reputation, but it was already too late. Within two years, Lola Montez hit the world’s stage. As a fiery Spanish dancer, she did whatever she pleased. She created scandal and left revolution in her wake. In many ways, she was the embodiment of her age. In An Invitation to Dance, she tells her own story in her own inimitable way. Marion Urch lives in North Islington.